The shadows were lovely, the tree was a delicious mango lemon blend. A distant hill peeked out from foliage, with a smoky blue haze reminding me of NSW. And of course, the drivers were looking at me as if there was something wrong. With me! Why would I be taking photos of the road?! Hmmm, I liked the pretty colours and shadows?! 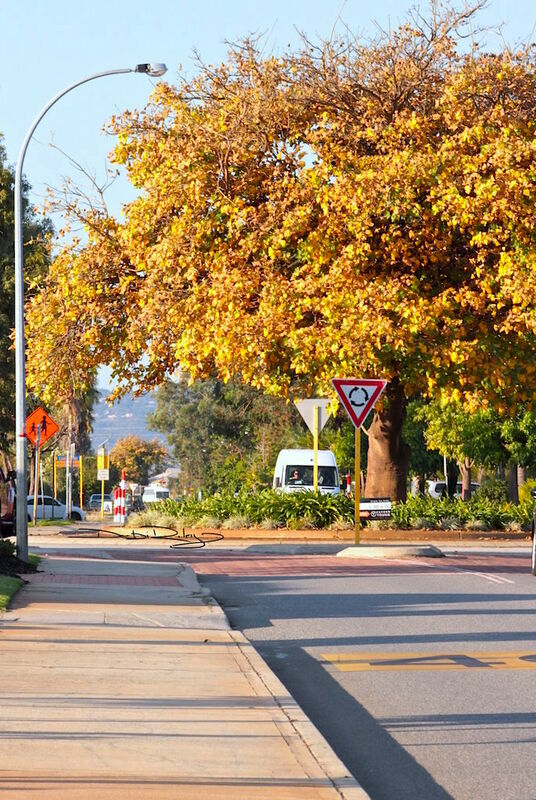 Autumn is now my favourite season, I think its perfect. Not too hot, not freezing, just right. In Autumn, the colours seem to be softer – yet more radiant in a luminous way. And there’s a gentleness to the atmosphere that creates a nearly intangible feeling of relaxation and peacefulness that a boiling hot summer doesn’t have. Great to get loads of work done, get out and do a lot of walking and photos. I used to love summer the most, but thats all changed. Autumn is lovely! The colours that I see and use in these images are predominately warm yellow biased ones. Naples Yellow, Quinacridone Sienna, Quinacridone Burnt Scarlet, Buff Titanium… slightly cooler version but still belonging to the family. Winsor Lemon warmed with permanent rose. 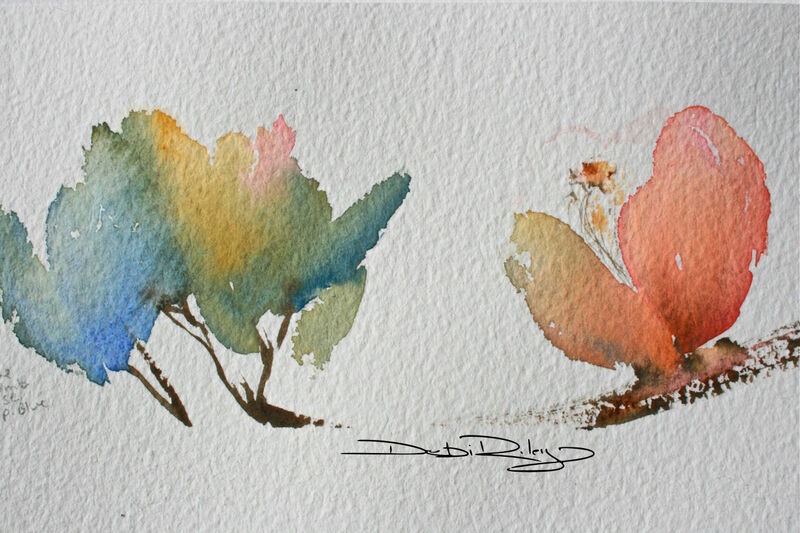 For most of these colours in watercolours, I use Daniel Smith brand. Especially the Naples Yellow. That Naples Yellow has a perfect warmth to it, with more cleanness and versatility than the other 20 brands I have! The Quinacridone Sienna is a real treat, clean warm mixes beautifully with just about everything you throw at it. Buff Titanium – is an opaque. So you will, can run into dilemmas if you are not judicious with your use. By itself, it is Wonderful! Mixed with a Stainer, with care, it is fine. But willy nilly mixing is a problem, giving some murky mud. Experiments. Taking a risk. Trying something and seeing if it works…. or not! What ifs…..
We need to take more artistic creative risks. Not stay in the same safe zone because – its been ok so far. Or thats the way others have said they like it to be. Or we are too anxious to try to change some little things. The post today is experimental in several ways: mixing up photographs with paintings, used a different resize process on these images, used a new signing app, used an old photo and revamped with a new developing program. Then hoping for harmony and cohesion. Its a ….. Risk. Looking at my past months of posts: some worked, some didn’t. You liked some, you didn’t like others. Thats ok. There are some I really really like! And some I’d like to bin. But they’re good records, of what works. And what does not. Any way you look at it, none are a failure. They serve to educate. Maybe you could experiment with Daniel Smith Naples Yellow. Or Buff Titanium. Quinacridone Sienna…. 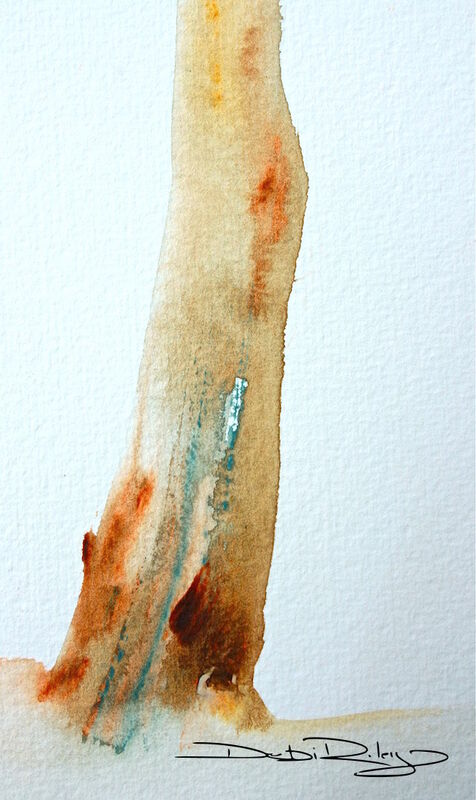 Try it with winsor lemon, with prussian blue, with burnt umber, with permanent alizarin crimson, with white, with french ultramarine! Or take photos with all the drivers gawking at you! 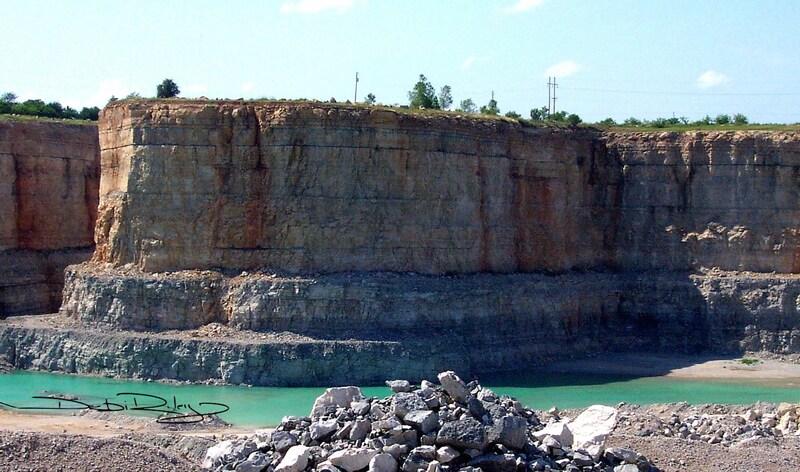 Texas Autumn (photo) has a dominance of buff titanium, with quinacridone sienna and hints of naples yellow along the quarry ledges. Gum Tree Glows painting is mainly quinacridone sienna with hints of winsor lemon, hints of naples yellow and a slash of cobalt teal. Autumn Gold watercolour landscape is predominately naples yellow (background) with quinacridone sienna, winsor lemon and a bit of burnt umber for deep darks. 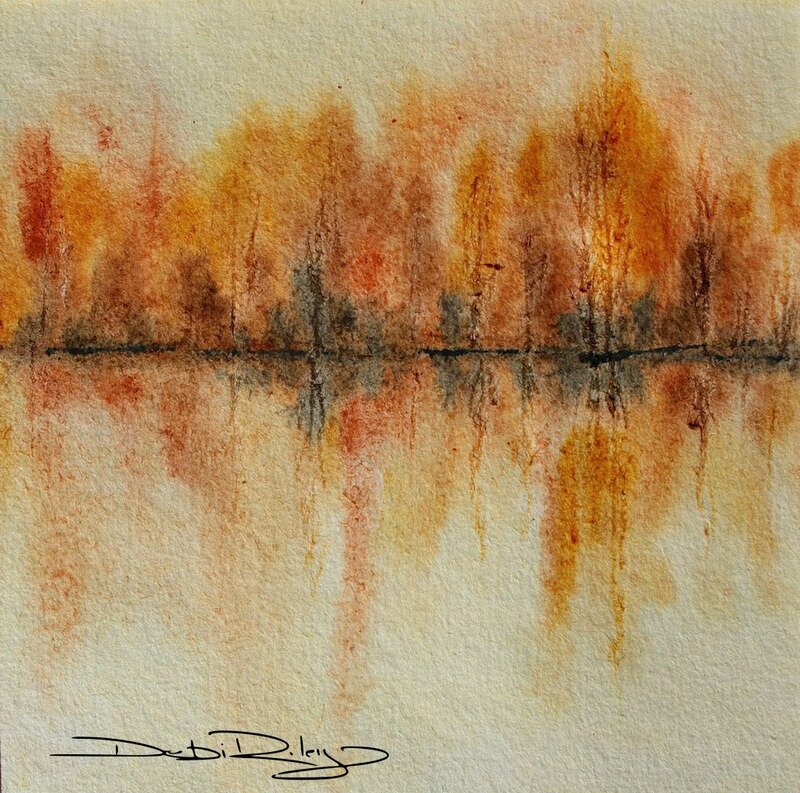 This watercolour painting is full of soft gentle edges, the warmth of autumn and the serenity that autumn elicits. These images were from the different geographical areas we have lived – Sydney, Texas, Perth and Poulsbo Washington in the Pacific Northwest. Where ever we have lived, the early autumn has been a lovely colour filled and welcome season. thank you very much Mary, thanks! I just bet you are quite happy to wait awhile for autumn !! 🙂 summer there is actually relatively pleasant, so I can definitely appreciate that fact!